When you do not have enough bone in your jaw for dental implants, building more bone via bone grafting is the common solution. You may also be loosing a tooth and need to preserve bone for a future dental implant. 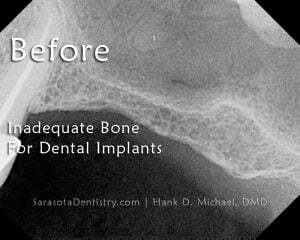 Sarasota Dentistry offers several bone grafting options to restore and maintain the natural shape of the patient’s gums and jaw prior to receiving dental implants. A patient who chooses one of these five bone grafting procedures can be properly prepared to receive dental implants that will restore their smile and/or fill in a gap from a missing tooth. e narrow or short due to resorption. Narrow or short alveolar ridges can be too small for the placement of standard diameter dental implants and require ridge augmentation. Ridge augmentation can be used to successfully grow bone either vertically to gain height for dental implants or horizontally to gain width for dental implants. There are a number of proven techniques to accomplish this task with little to no pain. 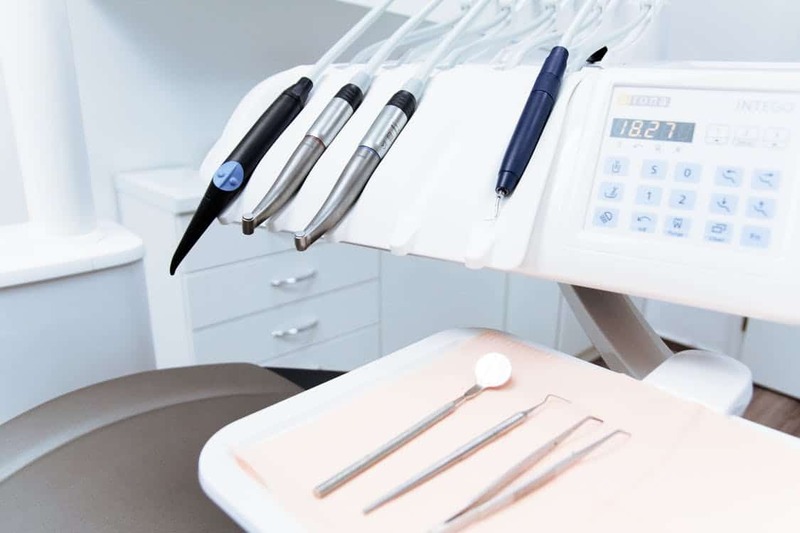 The procedures are usually done utilizing oral or I.V. Sedation so the patients don’t have to suffer. 3D technology, as well as, tissue engineering and advancements in biomaterials make these procedures much more tolerable and predictable than they were in the past. Patients suffering from insufficient bone now have a solution regain the foundation needed for dental implants in the alveolar ridge. Sinus augmentation, also referred to as a sinus lift, is the third bone grafting option. It is important to note that there is a difference between the sinus augmentation and a sinus lift. A sinus lift is a procedure in which the floor of the sinus is pushed up trough the hole that was made for the dental implant. 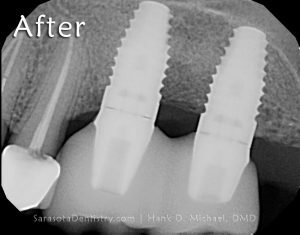 It is a fairly easy procedure that comes in handy when you only need a little more bone for a slightly longer implant. The alternative to the sinus lift might be a shorter dental implant. Sinus augmentation, on the other hand, is used to gain a large volume of bone in the molar and premolar region of the upper jaw. Bone loss in this region is common following the loss of teeth in the upper jaw. Usually a larger volume of bone is needed for dental implants in this region. Fortunately, the sinus augmentation is virtually painless and a very predictable technique for regaining the bone necessary for dental implants. Oral or IV sedation are available here at Sarasota Dentistry. The “split ridge” augmentation or bone grafting procedure is used to widen a ridge that has sufficient height. It can be wonderful procedure if used correctly to widen the alveolar ridge. The alternative option would be a horizontal ridge augmentation. Three dimensional imaging and thorough evaluation of your bone and dental implant needs would dictate which procedure is most appropriate. The simplest and most necessary bone graft of all is the “socket graft”. This procedure is done at the time of a tooth removal and is proven to preserve bone following the removal of a tooth. Bone will grow back following an extraction without a bone graft but not as much as with a socket graft at the time of the tooth removal. While the this ridge preservation procedure is usually always indicated to prepare the jaw for a dental implant, it is not always needed or wanted -especially if a dental implant is not going to replace the missing tooth. Socket grafting with PRF or platelet rich fibrin is also another way to enhance bone growth and help to prevent the dreaded “dry socket”. 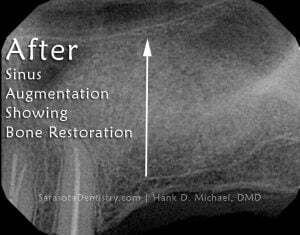 Socket grafting definitely reduces the risk of a “dry socket”. The team at Sarasota Dentistry can help you determine which procedure(s) are most appropriate for your case. The types of materials used in vertical ridge, horizontal ridge, sinus augmentation, split ridge or socket grafting varies. Aside from choosing a range of bone or bone-like materials for grafting, other substances both natural and synthetic can aid the patient through the process. Many bone grafts are performed using bone from the patient’s own body (autografts). Excess bone is often harvested from the chin or lower jaw and is then added to the deficient area, which creates the scaffolding needed for dental implants. Bone may also be harvested from cadaver donors (allografts), or even animal bone sources (xenografts). Have a question about which type of bone graft is right for you? Call 941-929-7645 to set up an appointment and discuss your options with Sarasota Dentistry. Other materials may be combined with natural bone to enhance the graft. Gem21, PRF, and/or Infuse are common options that may be mixed with the natural bone and placed in the bone graft site, which is then stabilized with membranes, titanium meshes, tacks, and/or screws. The site must then heal for a period of months prior to the dental implant procedure. Platelet-rich fibrin (PRF) may also be used; it is naturally harvested from the patient’s blood and used to fill the extraction site to accelerate healing and protect it from infection. Bone grafting via vertical ridge augmentation, horizontal ridge augmentation, sinus lifting, split ridge or socket grafting provides the patient with enough bone to receive dental implants. Following these procedures, their smile can then return to its beautiful, normal state, restoring the patient’s confidence and self-esteem. Aside from the aesthetic advantages, bone grafting also prevents further dental complications, as the added bone reinforces the jaw structure and prevents resorption from occurring. Bone Grafting: What Do I Do If I Don’t Have Enough Bone For A Dental Implant? "I just like the way he treated his employees, and in return, they respected their customer. "